In the interest of full disclosure, I feel like its an appropriate time to make a confession here. I have a sticky little secret. Ok, ok, the secret’s neither sticky nor little at all. The sticky part is actually a temporary adhesive that leaves behind no tacky residue. And physically, the secret is one that is blue and pink, and approximately 18″ x 18″ and 12″ x 12″ respectively. You see, I’m a Post-it note junkie. Writing books is really just an excuse to literally paper my house in gigantic and slightly less gigantic Post-it notes. If I tried to rein in my addiction, 3M stocks might just plummet. 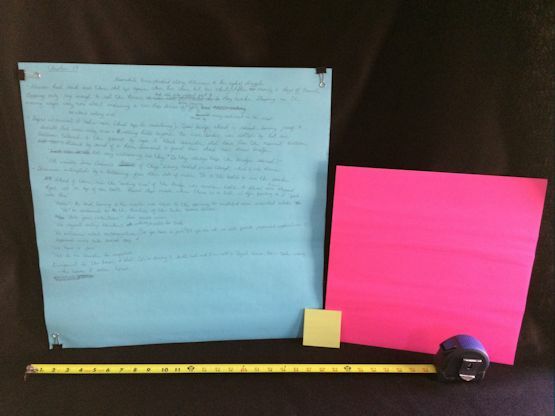 No spoilers here, the notes on the blue Post-it are for half of Harbinger’s Chapter 19. I’ve mentioned my notebooks before, which are my long-term idea storage solution. Post-it notes serve another purpose. For each book, I start by formulating a high-level outline of the main themes and work down from there into more specific parts–main events, character development, conflicts, etc. I use that high-level outline for the book as a checklist as I write each individual chapter to make sure I’m staying on track with timing of events and to ensure I don’t leave out any important details. For each chapter, I start with a fresh blue Post-it and outline what needs to be written in that specific chapter. Some portions of the outline will be skeleton-like summaries, while other times I’ll actually write out the exact dialogue or descriptions right on the Post-it. I love it. I’m all for structure and planning. Glad I’m not the only one! I think, for me, it comes from all the technical writing I did while working in materials science. The type of writing has changed, but the method is the same. Ok I am jealous of your organizational skills! I have a totally broken brain that tries to organize and plan things in like 30 second frenzies, while the rest of the time I’m just a lazy mess, so I just wind up with random bits of scribbles on napkins everywhere. I’m a sticky note addict too! Do you have a white board to put up your sticky notes? Or do you keep them stacked in order to make a kind of sticky note booklet? Haha! That would be nice! Thanks again for sharing your process. I was expecting a different secret 🙂 Not about post-it. It was too obvious 🙂 But, sometimes, what is obvious is the right way, right? I’m not a post-it addict, but I use it for important things. Ahh, a fellow sticky note addict. I have lots of fun shapes and sizes. I’ve never seen giant ones though! Too funny! I’m the same way but with little post it notes. Sometimes the smaller the better. I even cut them to just the right size to mark on and leave a reminder note or as ideas for new blog post titles Love it!